As stated in Space Policy Directive-1, “The NASA Administrator shall, ‘Lead an innovative and sustainable program of exploration with commercial and international partners to enable human expansion across the solar system and to bring back to Earth new knowledge and opportunities. Transition U.S. human spaceflight in low-Earth orbit to commercial operations, which support NASA and the needs of an emerging private sector market. 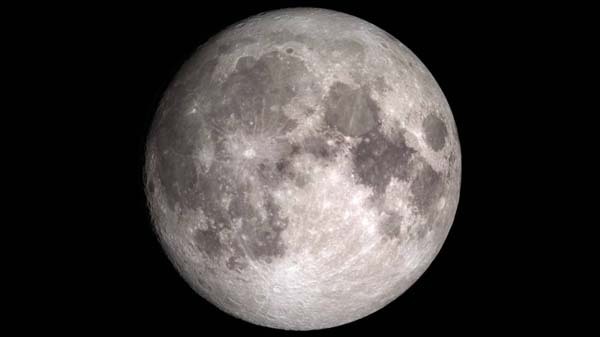 Extend long-duration U.S. human spaceflight operations to lunar orbit. Enable long-term robotic exploration of the Moon. 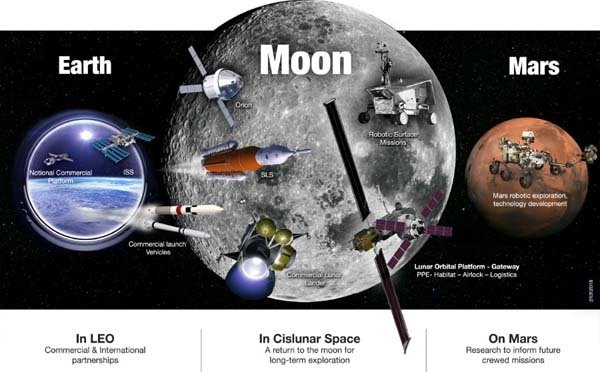 Enable human exploration of the Moon as preparation for human missions to Mars and deeper into the solar system. Seek potential incentives that could enable broader participation by providing commercial transportation and access for both cargo and crew to the ISS for new users of space. Interact with and leverage where appropriate lunar orbital and surface activities outside of NASA (e.g. depots, on-orbit assembly, inter-nodal servicing, and scientific assets and facilities). If SpaceX has Elon time what time does NASA have? If the time lines stated here are aspirational, what are the financial expectations here called?. Speaking of SpaceX, they are ramping things up at McGregor, TX for the BFR. The latest spy photos are included in the article as well as a video of a Raptor firing. This will be used as a wrecking operation against having any real space policy. If I’m right, we’ll see no lander development, and no development of rovers or habitation architecture. That may play into Space X’s and Bigellows hands. But without a lander it will again become a wrecking operation. Indications either way will be had by looking at how Brandenstein’s NASA responds to BFS and BFR should they come online during their watch. My bet is Brandenstein’s NASA ignores them, and will give short shrift to a ACES derived lander, but that means a delay into a second Trump admin or even beyond that. Looks cool, go do it! If BFS comes online more or less on schedule. The NASA exploration road map will become an interesting historical what if document. Since most of the NASA exploration goals could be undertaken with the BFB & BFS combo with no further development of launchers, transfer vehicles, orbiters & landers. Remember the BFS is a Moon lander that could return to Earth without refueling. I would not be surprised if you are right. I personally think the government is not interested in space development for fear it will create a new mandate that must be funded. I think the trick is for SX, Bigelow, and ULA to come up with working hardware that can catch an administration during a policy change and align their working hardware with that policy. Then it can take hold and become the ongoing mandate that will be funded. You avoid the build up period where political opponents and competitors for the funds can tear the project apart before it flies. We need the private sector with is ability to serve many masters to provide cross funding to a project from serving other economic functions that lie beyond the reach of politics to keep architectures alive and functional. If it wants to, NASA can ignore BFS for a long time. Should BFS be delayed, and all history says it will be, they’ll harp on that until the cows come home. They can invoke safety, inexperience with dealing with spacecraft of that scale, you name it. My gut tells me NASA will pretend BFS does not exist for a very long time. Hope I’m wrong. MSFC is certainly going to give it the old college try. It’s been 46 years since humanity went beyond LEO in the flesh…Doug Messier and many of the rest of you weren’t even born yet when it last happened. A lot of changes have occurred in spaceflight technology and in western culture in those 46 years….GO back further to 1960, and NASA’s most powerful rocket, the Titan, was only 1/3rd as powerful as the Falcon 9. In 1960, NASA lacked computers. They resorted to using human beings on mechanical adding machines.They had ordered a transistorized, wall-sized IBM computer called IBM 7090 that was capable of doing 24,000 calculations per second using FORTRAN. …WOW!! 24,000 calculations per second from a wall-sized computer! Imagine trying to send a message to a message-board like this using that machine? …And NASA in 1960-62, like America in 1960, was very different!…Colored people had to use their own washrooms. They were arrested for protesting segregation at lunch counters, etc. Women and blacks were denied promotions,etc for their gender or race. Vacuum-tube black and white TV sets were the way Americans viewed live programs. Liberals in America wanted to ban the bomb out of fear of nuclear war, while conservatives back then wanted to drop the bomb on Russia before Russia may do so on D.C. and other US cities….It’s the reverse today. So I HIGHLY RECOMMEND you all see the movie, “Hidden Figures”, based on the true story of three African-American mathematics geniuses who worked for NASA IN 1960-1962, helping to solve difficult equations for spaceflight. One of them helped John Glenn launch on February, 20, 1962. The movie can be downloaded from Netflix, Youtube or purchased as Blueray or DVD disc. I highly recommend it!!! It has been 46 years since human beings went beyond LEO, isn’t that long enough? Most of you weren’t even born when it last happened. BTW, whatever becomes of this American future space plan and timeline, it is good to be reminded of what happened during the early years of NASA. There is a movie out called, “Hidden Figures”, about three female African-American mathematics geniuses who changed the direction of NASA, whom they worked for from 1960 on to the Shuttle era. They helped solve difficult equations for spaceflight, including helping get John Glenn into space in February, 20, 1962. Back then, NASA had barely acquired a wall-sized IBM 7090 mainframe that could do 24,000 calculations per second. WOW!!…LOL!!! …Things were much different then for America and NASA. African-Americans had to have their own separate public washrooms, etc… Most Americans watched B&W TV sets for ‘live’ programming. NASA had to rely on mathematicians with mechanical adding machines, pencils and paper. Manned spaceflight? Men on the Moon? These were concepts that NASA felt they lacked the means to achieve. LISTEN! If you are a GENUINE spaceflight enthusiast and are a GENUINE advocate of social justice, that movie is for you. Please go to Netflix, etc to download it.